Yesterday the International Monetary Fund (IMF) announced a reduction in its estimates for global economic growth in both 2014 and 2015. It now holds that it will be down to 3.3% from the previous estimate of 3.8% this year, and to 3.8% from 4.00% next year. While these rates show reductions they continue to indicate a growing trend and, historically, any expansion over 3% is regarded as a positive. A takeaway from the announcement is the fund’s concern that the growth that does take place will be uneven. The United States will lead the way but practically all other economies on the planet that matter will show weaker growth outcomes. They include China, Europe, Japan and Latin America. In regard to Europe, the IMF singled out Germany for special mention. Its growth forecast was cut sharply, to 1.4% from 1.9%. This is at a time when recent German industrial goods orders were the worst they have been since 2009. Hopefully, this is a temporary phenomenon, brought about by tensions between Russia and Ukraine and the trouble in the Middle East. 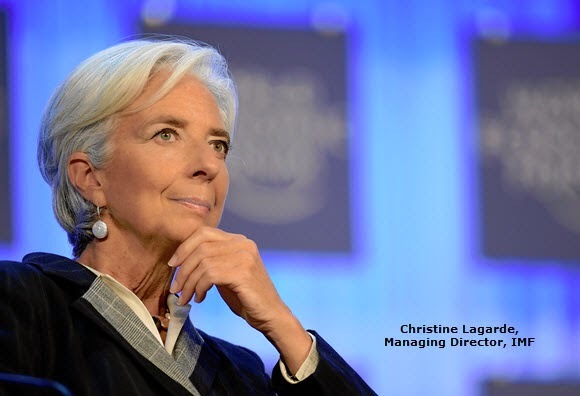 Madame Lagarde was, as usual, particularly concerned about low inflation in the Eurozone. This has been a constant refrain of hers now for over a year. The ECB is certainly aware of the problem but opposition from Germany to a lightening of the current regime of austerity, particularly in those UE member states that are recovering from the fallout of the great financial crisis, is hampering efforts at a solution. Now, it would appear from comments made yesterday, even the IMF is coming around to the view that austerity might have served its purpose and the time might be right for some expansive spending. Ironically, the decline in German industrial goods orders and the IMF downgrade of German growth come right after the calls from many economists for that country to start spending a lot more on its infrastructure in order to spur EU growth. The announcements from the IMF come on the back of aggressive purchasing of US dollars in recent times, so no surprises there. The troubles in Germany can be expected, also, to tend to prolong the decline of the Euro, as the economy that Angela Merkel presides over has long been the locomotive of Euro zone economic fortunes. Equities seem to be taking a hit but whether this is as a result of reduced global growth estimates or the realisation that the cheap money tap that had fuelled the rampant bull market is about to be switched off with the upcoming elimination of Quantitative Easing in the US, is open to question. Perhaps it is a bit of both.